Biosecurity Queensland (2013) lists permitted herbicides for control of C. grandiflorum as glyphosate as a cut stump treatment, and fluroxypyr and 2-4, D amine for spot spraying. Plants can be cut at waist height for glyphosate treatment in dense infestations, leaving supporting vegetation in place to rot away, and any resprout can then also be sprayed. However, management with herbicides is often made difficult because of their close proximity to water sources, and native species can be affected (PIER, 2015). A perennial, slightly woody subtropical climber which occurs naturally in tropical South America. 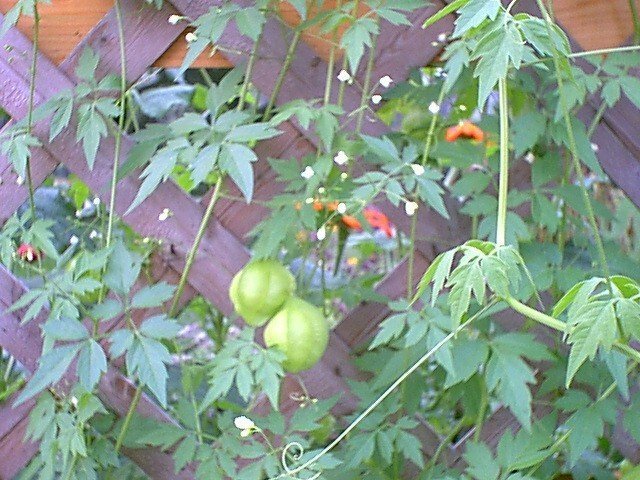 Its climbing tendrils grow 3-5m or higher, often draping themselves over trees. The stems are usually covered with bristly hairs. Easily recognisable with its compound leaf, which has toothed, light green, thin textured, hairy leaflets. Flower stalks bearing small white flowers arise from the leaf axils of the plant. The fruit consists of a roughly spherical, balloon-like, thin-walled capsule about 60mm long, which contains several large black seeds.